What is CNC Milling? | Kosmo Machine, Inc.
Milling is just one of the many crucial machining processes used to shape metals and other materials into the desired shape and dimensions. In milling, a cutting tool which rotates at a high speed is utilized to remove undesired material from the workpiece. The tool is moved at a certain angle with the tool’s axis. It can be carried out on small parts as well as on large heavier components. The process of milling is done through a milling machine or a mill. Before the advent of computing technology, milling was performed manually by hand or mechanically. Nowadays, it is conducted through computer numerical control milling machines. These machines are known as machining centers and come in either horizontal or vertical orientation, depending upon the cutting tool spindle’s orientation. A machining center consists of tool magazines, carousels, automatic tool changing system, computer control, enclosures, and coolants. Milling has now been integrated with turning and vice versa to allow more flexibility and increase productivity. Milling is similar to cutting and drilling and plays a vital role in the manufacturing industry. Whether it is an automobile, aircraft, mold, medical prosthetic, toy, household appliance, or a mobile phone, milling is present everywhere. Unlike turning which uses a single-point cutting tool, milling utilizes a multi-point cutting tool to cut away material from the workpiece. It is also different from drilling where the cutting tool is moved along its axis of rotation; in milling, the cutter is moved in a direction that is perpendicular to its axis of rotation, so that the workpiece is cut along the circumference of the cutting tool. In face milling, the cutter is used to create flat faces into the surface of the workpiece and the cutting is done at the ends of the cutter. Sometimes, it is also used to cut flat-bottomed cavities. In peripheral milling, the cutter cuts along its circumference; hence, the surface of the workpiece receives the shape of the cutter. It is generally used to make threads, gear teeth, and deep slots. 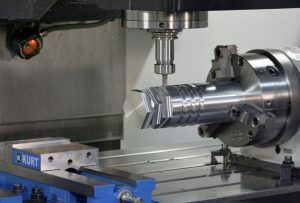 In the early days of manufacturing milling was done manually, but with the invention of computers and information technology, CNC milling machines became the best means of milling parts. The CNC milling machine is programmed using a programming language like G and M codes; these codes represent individual functions of the machine. When combined, they will result in an end product. As soon as the file is sent to the mill, it executes the instructions and starts drilling and cutting, turning itself along the axes to shape and cut the material in the required form. CNC milling allows for more flexibility, higher precision and accuracy, and faster turnaround time.